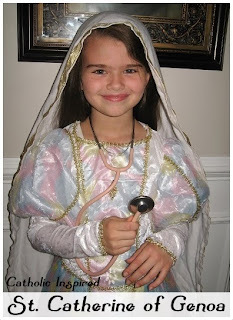 Our Elizabeth wanted to be Saint Catherine of Genoa for All Saints Day. 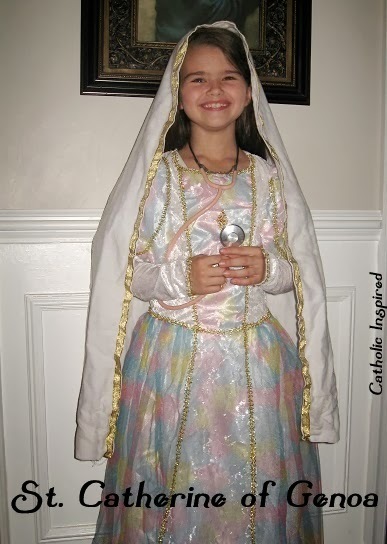 St. Catherine of Genoa was a new saint to me, and when we read about her life, Elizabeth chose her as the saint she wanted to model this year. (Caterina Fieschi Adorno, born Genoa 1447 – 15 September 1510) is an Italian Roman Catholic saint and mystic, admired for her work among the sick and the poor. She was a member of the noble Fieschi family, and spent most of her life and her means serving the sick, especially during the plague which ravaged Genoa in 1497 and 1501. She died in 1510. Our St. Catherine costume is a fancy long dress and gold trimmed veil, because she was born of a noble family. 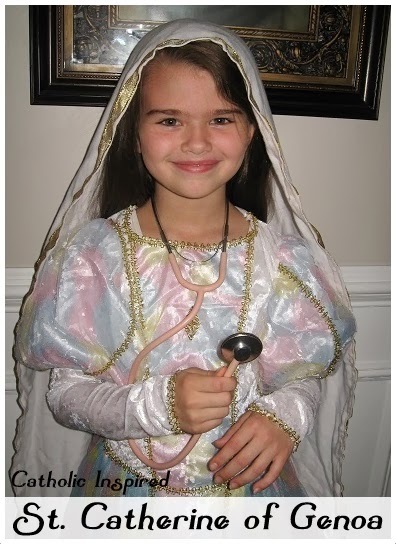 She is also wearing a stethoscope to symbolize her years spent as a nurse and administrator at a hospital in Genoa.